HH P4 Thin Phone Spacer! Spacers are cut, assembled and adheared with Hook-Loop Fastener in one step! Also see *P9 Twist-a-Tweak for update tweak initiatives. 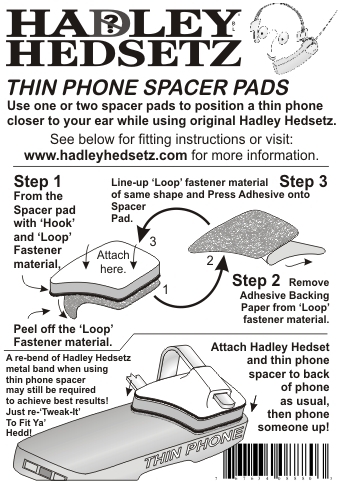 Or, Send Orders Including $2 Postage and Handling for pack of two 8mm Hadley Hedsetz Thin Phone Spacers ($6 per two-pack inc GST) To: Hadley Hedsetz, PO Box 4048 Mulgrave, Melbourne Australia 3170.